Tulips from McGinnis Ranch are always one of the first signs of spring at the Ferry Plaza Farmers Market. Come February, vibrant crimsons, peaches, and golds radiate from their stall, garnering smiles from passersby and serving as a bright reminder that spring berries are soon to come. While some aspects of the market are as consistent as the changing of the seasons, you may have noticed some fresh faces behind the flowers and vegetables at McGinnis’s market stall recently. 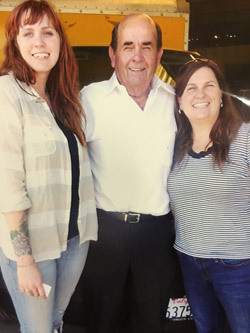 As Sandi McGinnis-Garcia and her niece, Sara Evett, take over the legacy created by retiring farmer Howard McGinnis, they are also ushering in a new era for the fourth-generation family farm, transitioning to organic and establishing a voice in the boy’s club of agriculture. Stone fruit is not a product many customers associate with McGinnis Ranch, at least not since Howard McGinnis took over the farm from his parents in 1968. In 1944, his parents purchased the land for growing apricots (which they sold both fresh and dried) as well as daffodils. After the San Luis Reservoir was built in 1962, however, the climate was so drastically altered that the area was no longer conducive to growing apricots. Though technically a second-generation farmer, Howard learned the nuts and bolts of the trade first-hand while transitioning the land from fruit to vegetable farming. “Most of it was just trial and error,” says Howard. Howard’s successes soon outweighed the errors after he left his day job at PG&E to run the farm full-time. His 100 acres supplied produce for retailers Lucky and Raley’s, until stiff competition for contracts with major distributors eventually moved Howard to try farmers markets as a more reliable sales channel. But even in the couple red ink years when the farm didn’t break even, Howard has always found farming rewarding. “I guess, at heart, I’m a gambler,” he laughs. Howard had no trouble building McGinnis Ranch’s following selling direct to customers. “He has always had a really good name,” says Howard’s daughter, Sandi. “People want his zucchini over the others because of the quality at a reasonable price,” the same reasons customers stay steadfast to McGinnis Ranch today. 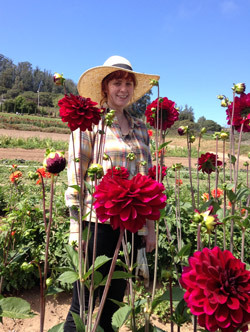 She gave city life a run in her twenties, but found herself nostalgic for the farm and returned to fulfill her dream of living and working full-time at McGinnis Ranch. With the average age of US farmers exceeding 58, keeping family farms in production and passing them onto the next generation has become more urgent than ever to ensure a food secure future, which makes Sandi and Sara’s decision especially well-timed. 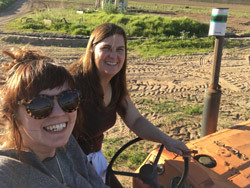 As if taking over farm operations weren’t a huge undertaking in itself, Sandi and Sara are also in the early stages of transitioning to organic. According to Sandi, they’re well on their way, though the certification will require some changes in their practices and many site visits, applications, and soil checks. The biggest hurdle in this transition process? “All the paperwork!” exclaims Sandi. They expect to complete their organic certification by 2018, keeping the same crops they presently offer and trialing new beet varieties, fennel, and additional cut flowers. At a time when female farmers control only 7 percent of all farmland in the US, women entering the field are still considered pioneers and are often forced to justify themselves to their male counterparts. But high risks and hard, manual labor are nothing new for Sandi and Sara. Pick up spring flowers and support the next generation at McGinnis Ranch on Tuesdays and Saturdays at the Ferry Plaza Farmers Market. Farm photos courtesy of McGinnis Ranch.